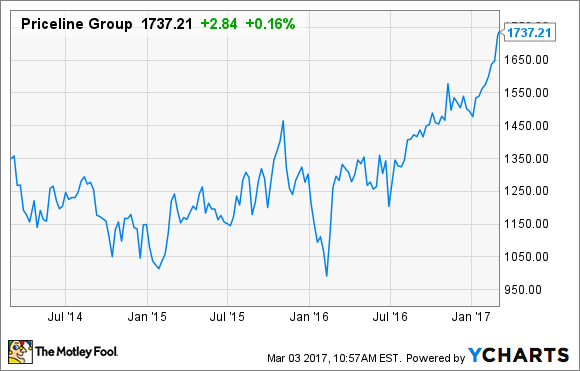 Why Is Priceline's Stock at All-Time Highs? The largest online travel booking site keeps getting bigger. For the better part of a year now, shares of Priceline Group (NASDAQ:BKNG) have been relentlessly pushing through to new all-time highs. After reporting on its fourth-quarter and full-year 2016 business results, the stock jumped again and is now nearing the $2,000 per share mark. Priceline's steep revenue growth trajectory flattened a bit in 2015 and early last year. Overseas economic woes and political uncertainty all played a factor, and share prices spent some time moving sideways for a while. Sales growth has resumed its aggressive rise once again in more recent quarters. Glenn knows our global business inside and out, and he has been a key player in almost all of the major strategic initiatives for The Priceline Group over the last 16 years. He was a primary driver in key acquisitions including Active Hotels, Booking.com and Agoda.com, which have created strong growth opportunities for the Group and favorable returns for our shareholders. In other words, Priceline is happy to keep using the same formula. And why not, as full-year 2016 revenue increased 16.5%. Excluding a big impairment charge taken in the third quarter on the Open Table acquisition from a few years back, profits increased 21%. Also in recent news was Priceline's purchase of travel metasearch engine Momondo Group. The acquisition will ring up for $550 million in cash and will come under the supervision of Priceline's own metasearch site, Kayak. The goal of the addition is to help Kayak expand in Europe, which happens to be Momondo's home base. This is the biggest deal Priceline has inked since the aforementioned Open Table acquisition in 2014. The bill on that deal was $2.6 billion, a much heftier sum for Open Table's $225 million in revenue during that year. Momondo did just over $100 million in 2016 at current exchange rates, so Priceline's purchase this time around looks like more favorable terms. Moving on from acquisition activity, management's outlook for 2017 so far looks bright. CEO Fogel said the focus will be, as it has been as of late, on growing its supply of bookable properties, investing money in its online platforms to increase ease of use, and efficient marketing. For the first quarter, those efforts are expected to translate into a 17% to 22% increase in gross travel bookings from last year. Is it too late to buy? All the positive business news and results have pushed Priceline's shares to new peaks, but that doesn't mean this ship has sailed. As I outlined here, there are several reasons for continued optimism. Priceline estimates that the global travel industry does over $1 trillion a year in business, putting the travel group's market share at a minuscule less than 1%. Booking online is also a very small portion of that overall figure, with only about a third of accommodations like hotels and rentals being reserved online. Both of those figures leave plenty of room for the company to grow. Analysts' average expectations are that Priceline's profits will grow another 13% this year and by an average of 17% in each of the next five years. That is a rosy outlook for a $10 billion-a-year-plus company. However, Priceline owns a big head start on developing user interfaces over smaller competition like Trip Advisor, and it has a deeper presence in the growing international online travel market than rival Expedia (Expedia did 43% of business overseas last year to Priceline's 87% at last report). 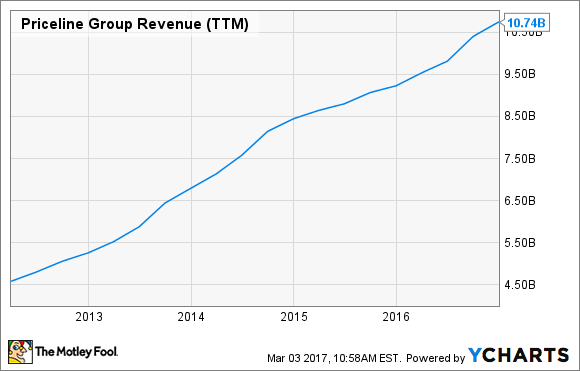 The Priceline Group has been a high-flying growth company for over a decade now, and it looks like that run could continue unabated.